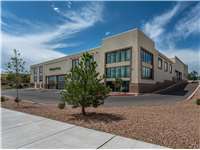 Located at the corner of Vegas Verdes Dr and Camino de los Arroyos south of Cerrillos Rd, Extra Space Storage serves residents of Santa Fe and Agua Fria. Locals will recognize our facility near the Alameda Condo south of Los Alamas National Bank. Extra Space Storage is about 5.2 miles from Santa Fe Regional Airport, so we're an excellent solution for residents and visitors who need Santa Fe self storage close to the airport.